After incredible success and demand, esteemed performer and international pop icon P!NK today announces her Beautiful Trauma World Tour will extend in to 2019 with an additional 37 spring dates across North America. 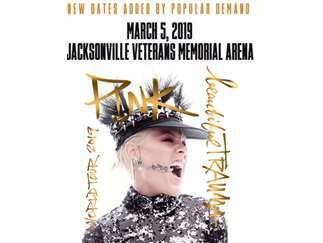 Produced by Live Nation, the new outing will kick off March 1, 2019 in Fort Lauderdale, FL and will come to Jacksonville Veterans Memorial Arena March 5, 2019. The highly praised show will also make stops in Nashville, New Orleans, San Antonio, Los Angeles, and more before wrapping May 21, 2019 at Madison Square Garden in New York City. Media praise for the can’t miss Beautiful Trauma World Tour includes: “Pink kept raising the stakes throughout the show, which is packed with aerial thrills, huge dance numbers and her unique collection of gritty, uplifting anthems.” – Newsday “…ultimately this show was designed to visually woo, and it succeeded mightily. I’ve seen my share of mammoth pop spectacles — Katy Perry, Taylor Swift and Gaga all come to mind — but this was sheer magic.” – NewJersey.com “…while Pink may be one of pop music’s biggest stunt queens, she’s a consummate singer, performer and showman.” – St. Louis Tribune “Employing wires and stage props like a giant, spark-spewing chandelier and deformed street lights that looked as though they'd been lifted from a Picasso painting, Pink and her team essentially repealed the law of gravity for the night.” – Cleveland Plain-Dealer Since her debut in 2000, P!NK has released 7 studio albums, 1 greatest hits album, sold over 50 million albums equivalents, over 75 million singles, over 2.4 million DVDs worldwide and has had 15 singles in the top 10 on the Billboard Hot 100 chart (four at #1). In addition, she is the recipient of three Grammy Awards (19 nominations), one Daytime Emmy Award, three Billboard Music Awards, seven MTV Video Music Awards (including the 2017 Michael Jackson Vanguard Award recipient), two MTV Europe Awards, two People’s Choice Awards, was named Billboard’s Woman of the Year in 2013 and has sold out arenas all over the world. Her seventh studio album, Beautiful Trauma is certified platinum, debuted at #1 on Billboard’s 200 chart and marked a career high for first week sales. Additionally, the album debuted at #1 in 10 other countries, on Billboard’s Top Album Sales Chart and Digital Albums Chart. The first single, “What About US” is also certified platinum, received a Grammy nomination for Best Pop Solo Performance and reached #1 on the Adult Pop Songs chart earning her ninth leader on the chart, the most number-ones at the format for a female (second overall).